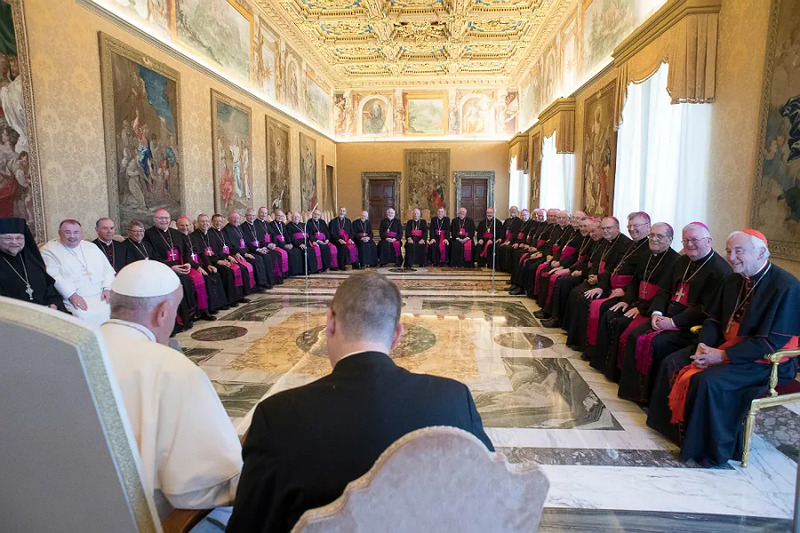 London, England, Oct 2, 2018 / 03:21 pm (CNA/EWTN News).- The bishops of England and Wales held their five-yearly ad limina visit to the Holy Father last week, at which Pope Francis encouraged them to live the faith joyfully. The English and Welsh ad limina was held Sept. 24-29. The bishops noted that they were joined on a number of their visits in Rome by two bishops of the Church of England, and on one by a representative of the Conference of Religious in England and Wales. Ahead of their ad limina, the English and Welsh bishops had issued a statement addressing the recent sexual abuse scandals in the Church, both in the UK and abroad. They also announced an independent review of current policies and procedures for child protection and for handling complaints of sexual abuse. The Bishops’ Conference of England and Wales includes the 22 dioceses across the two countries. Its membership also includes the Military Ordinariate covering the armed forces of the UK, the Apostolic Eparchs of the Ukrainian and Syro-Malabar Churches in Britain, the Ordinary of the Personal Ordinariate of Our Lady of Walsingham, and the Apostolic Prefect of the Falkland Islands. Edinburgh, Scotland, Jul 11, 2017 / 12:38 am (CNA/EWTN News).- Twelve men are set to be ordained priests in Scotland this year, a 20-year high that Catholic leaders credited to prayers and other work to encourage vocations.